(Cowes, Isle of Wight, England)- The 2017 edition of the RORC Vice Admiral’s Cup continued to expand its inclusion for one-design and offshore classes that have made their mark on the famous “river” known simply as the Solent. Again, the J/Boats were well represented by the J/109 and J/111 classes, with five of the former and six of the latter entered. Among the J/109s were the second and third placed finishers from last year's Nationals: Robert Stiles' DIAMOND JEM and David Richards' JUMPING JELLYFISH. The J/111 line-up included reigning World Champion, Martin Dent with JELVIS. Campaigning the J/111 since 2014, Dent typically sails with a young team, including family and students. He reckons being World Champion means nothing, "It is a good fleet and we'll be struggling again against the top teams, like Tony Mack on McFLY, Cornel Riklin on JITTERBUG and Chris Jones & Louise Makin’s JOURNEYMAKER II." 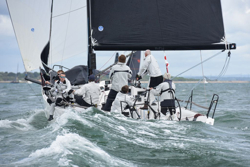 The Vice Admiral's Cup is becoming a must-do regatta for the J/111s as it is the first event of the year they sail under class rules (as opposed to IRC), limiting their sail inventory and to sailing with one 'pro' on board. Dent also likes it being a three-day event..."that's better than two and the Vice Admiral's Cup has always got good race management." As to J/111 racing, Dent continues: "It is such good fun: you put the kite up and start ripping downwind at 16-17 knots, and you think 'great – we're going really fast', but then you find that everyone arrives at the same time at the leeward mark. It’s never a procession, there are always lead changes! !” Here is how it all went down for Martin, the J/111s and the J/109’s at this year’s Vice Admiral’s Cup. The Solent laid on perfect conditions with brilliant sunshine, wind that built from 10-20 kts through the afternoon, building up a steep chop that was enough to cause crews to struggle to keep boats beneath rigs! Almost “fresh to frightening” sailing weather. Dent’s JELVIS repeated his World Championship-winning form, posting a 1-3-1 to lead the J/111 Class, but by just one point from Cornel Riklin’s JITTERBUG. Simon Perry and the crew on JIRAFFE did one better to lead the J/109 class with a 2-1-1 scoreline, which Perry reckoned was the best his team had ever managed, albeit coming straight out of a win at Warsash Spring Series, “we’re savoring the moment. What we enjoy most is sailing with a good group of boats." Conditions turned positively autumnal as crews found themselves wrestling their boats around the courses in 15-20 knot winds until a squall caused conditions to gust up to 28 knots, plus rain and reducing visibility. Some clearly enjoyed the brisk conditions. Mack's McFLY scored three bullets to take the lead in the J/111s. After her stand out Friday, Simon Perry's J/109 JIRAFFE found it harder going, but managed to retain the lead in the J/109s. John Smart's JUKE BOX was the lowest scorer winning the opening race, with David Richards' JUMPIN JELLYFISH and Robert Stiles' DIAMOND JEM claiming honours in the subsequent two. Commenting on their three bullets on the J/111 race track, Tony Mack said, ”It was lovely sailing- we are delighted with our results. Sometimes I think things just go well for you and you make the right calls and other days you don't seem to. Perhaps that is why we keep coming back!" The J/111s sailed two windward-leewards today ending the day with a round-the-cans course that was shortened at Gurnard Ledge. Even the invincible McFLY had her upsets, including one wild broach coming out of a gybe!! No one is infallible, that is for sure! While the results indicate otherwise, racing among the J/111s was still close. "You had to try until the very end. In the J/111s there are some very good owner-drivers," concluded Mack. Sailing concluded on the central Solent in lighter 10-13 knot winds, this time blowing from the east. The leaderboard was very tight across the J/classes, so discards decided their outcome. In the J/109s, the final day brought about a change of leader with Robert Stiles on DIAMOND JEM edging out David Richards’ JUMPIN JELLYFISH by a point, in turn finishing one point ahead of Simon Perry’s JIRAFFE. "It has been very, very close racing," admitted Stiles. "We won it on the last tack going into the windward mark. It has been a real ding-dong all through the event. We are delighted to have won it two years in succession." JUMPIN JELLYFISH had managed to get the overlap on DIAMOND JEM at the final mark of the first race to finish ahead but in the second race DIAMOND JEM turned the tables. "It has been three days of great sailing," said Stiles. 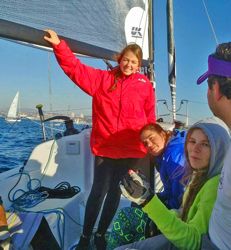 "It is a really nice regatta and there were some great courses." Racing in the J/111 class also came down to the last race with Tony Mack’s McFLY managing to beat Martin Dent’s World Champions crew on JELVIS by a mere point. 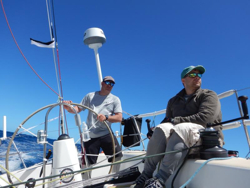 "It has been a fantastic three days of sailing,” said Dent. "It has been a fabulous variety of racing– we have had all conditions. The Vice Admiral’s Cup does proper justice to a one-design fleet and it is credit to the RORC race team in setting courses that are challenging, but fair." JELVIS claimed the first race after winning the pin at the start. Prior to the start of the second race JELVIS and McFLY were involved in a match-racing style dial-up. JELVIS then sailed their opponent away from the start area, but then at the gun, they got held up by another boat that was OCS, enabling the wily Mack to get away. As a result, McFLY beat JELVIS to the overall win by just a point. 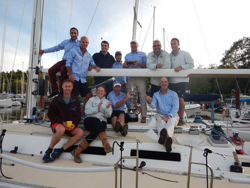 For more RORC Vice Admirals Cup sailing information Add to Flipboard Magazine. J/88 Family Speedster Loves Chile! (Higuerillas, Con Con, Valparaiso, Chile)- On April 29th, Juan Pumpin’s brand new J/88 ESAUTOMATIX made its debut at the Regatta Mes del Mar hosted by Club de Yates Higuerillas, north of Valparaiso in the Con Con region. 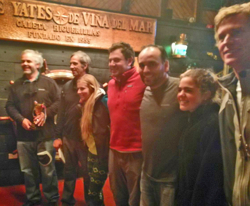 This was the yacht club that was heavily affected by the big storm of August 2015 (essentially a Low that could have been classified as a Class 4 hurricane), but now was back and better than ever to host regattas for their friends and sailors all over Chile and South America (a similar story to New Orleans’ famous Southern YC phoenix-like resurrection from the ashes). Initially programmed for a start at 1330 hrs, the CYH RC sent the twenty boats to the race course and made them wait for 3-4 hours. Finally, a nice seabreeze of 10-15 kts came in from the southwest and one W/L race was held for the fleet. This race was the debut for J/88 #79. The crew was composed of owner/ skipper Juan Pumpin, his two daughters (Maida & Cote), Juan Reid, Pablo Gallyas, Isidora Urrutia and Ignacio Leiva. Juan comments on their experience, “We started in the middle of the line with boats from 22 ft to 60 ft long on the same starting line! We started fine in the middle of the line, with Caleuche (former IRC Emme 36) and First 35 Aura (IRC 3 winner for the last 5 seasons) to windward. So, the challenge was to keep the position against these two IRC fully-tuned boats, plus the bigger boats like the Swan 65 and the X-50 coming from behind at full speed!! We succeeded in going fast to the left side of the course. We ended up over-standing upwind on the left layline, with frontal chop, we were getting to the windward mark a little ahead of the Swan 65 coming full speed on the starboard layline! It was a hard time to decide what to do!! Tack or cross?? Classic problem!! But, the brave crew decided to tack in front of the big Swan 65. Easing the sails out of the tack, the J/88 accelerates immediately, so the big white Swan couldn't catch us and we round the mark just in front of them!! We hoist the asymmetric spinnaker. We didn't really know if going deep (soaking mode), or higher at 8-10 kts of speed with 12-14 kts of breeze, was going to be faster. We decided the latter was better (wrong)! We get to the leeward mark on the left side of the course; the J/105 started to approach and the leeward mark was starting to get very complicated. Add in the huge X-50 coming in from the right on port tack- watch out! We managed to round close to the mark and tack immediately. We lost 4 or 5 positions at the mark. But, getting to the left again on the windward leg paid big dividends, we were able to recover and again over the J/105s and others like the X-50. Coming in again from the left side of the course, we were able to tack in front of the J/105 FOGONAZO (the ultimate winner of the J/105 class). Again, we hoisted the big asymmetric spinnaker and took off downwind. Wow, this J/88 is fast downwind! We managed to increase the distance on the J/105s quite easily; we were learning in real-time from our mistakes regards downwind VMG! The last approach to the finish line was from the left side of the course, we were looking for more breeze in the RC Flag and we were just able to pass and beat the huge X-50 in real-time! We finished third in the IRC 3 class on handicap. And, were sixth on the water, in front of the X-50!! With no practice, no tuning, having no idea on how to sail the boat! Great boat, great crew. Impressive boat speed, especially downwind in a boat less than 30 feet of length. The sensation in comparison to the J/70 is quite similar, but in a bigger boat. The J/88 is very sensitive to steering and very easy and stable going downwind. Of course, you need to spend some hours to get a better understanding for the jib’s in-hauler setting going to windward. But, this was our first race! Furthermore, we knew our downwind VMG tactics were wrong, better to sail deeper and faster to take advantage of the J/88’s ability to slide downwind on even the smallest puffs!” For more J/88 offshore family speedster sailing information Add to Flipboard Magazine. (Scheveningen, The Netherlands)- Concurrent to the J/22 Worlds, the Dutch nation of sailors (most of the country) are hosting their famous North Sea Week that starts with two offshore races (the Vuurschepen Race & the RORC North Sea Race) and concludes with the North Sea Offshore regatta series for offshore one-design and IRC/ORC classes. There is no question an enormous factor in these events are top J/teams in all divisions. Starting with the kick-off event for the week of offshore sailing, the Vuurschepen Race starts off The Hague and goes across the infamous shipping channel known as “La Manche” (the ditch) over to England. Then, after a day’s rest, the fleet races back across the same “English Channel” to The Hague in time to participate in the balance of the North Sea Regatta. In the offshore races, the IRC class has twenty-three boats entered with Sylvain Duprey’s J/111 DJINN, Alain Bornet’s J/109 JAI ALAI, and Kees Mijs’ J/109 ARETHUSA competing against some of the strongest offshore teams in the North Sea. In the seventeen-boat ORC Doublehanded division, nearly 50% of the starters are extremely competitive J/crews! At the top end of the scale, first to finish honors should be Englishmen Bart Desaunois & Alex van Amstel’s J/133 BATFISH. But, they will be hunted down hard by a rogue’s gallery of pirates and veterans of the North Sea offshore doublehanded community, like the two J/122 teams that have won a lot of shorthanded events offshore- John van der Starre & Robin Verhoef’s AJETO and Chris Revelman & Pascal Bakker’s JUNIQUE. If that were not enough fire-power to make most people wince, they all have the following to contend with that are all capable of reaching the podium; like the two J/120s (MAVERICK- Chris Schram/ Ray Roesink and J-QUATTRO- Joost van der Wal/ Bob Weenink); the two J/109s (FIRESTORM- Wim van Slooten/ Jochem Hamstra and YETI- Paul & Marc van der Pol); and the lone J/105- the famous PANTHER sailed by the only all-women team of Yvonne Beusker and Edith Voskamp. In the thirty-seven boat ORC Division, with of the IRC division boats “double-scoring”, the only additional teams to add in this “fully-crewed” division are the J/109 TEAM HEINER 4 (Nikolaus Knoflacher), the J/109 JITTERS (Frederic de Visser), and the J/92 JINX (Luc Oomen). Following these two offshore events across the “big’ole ditch” between the UK and the Continent, the J/111 one-design class will have nearly a half-dozen boats racing one-design in their offshore season points series in The Netherlands. Those five nations represented include Norbert Burkert’s TOP JOB from Germany, Paul van Driel’s SWEENY from the Netherlands, Sebastien de Liedekerke’s DJINN from Belgium, Sigg Joerg’s LALLEKONIG from Switzerland, and Sjaak Haakman’s RED HERRING from The Netherlands. In addition, the North Sea Regatta will continue to see the next event in the Netherlands National Doublehanded Championship taking place going around the buoys! All J/crews from the North Sea races will continue to add points to their series with the aim of taking the season by the end of the summer. For more RORC North Sea Race sailing information For more North Sea Week/ North Sea Regatta sailing information Add to Flipboard Magazine. J/24 40th Anniversary Around Island Race Announcement! (Newport, RI)- Mark your calendars now. This could be an epic event. There’s no more iconic a race course in J/24 class history than the 21nm track around Conanicut Island in Narragansett Bay that helped decide the outcome of the first J/24 North Americans in 1978, and then the first J/24 World Championship in 1979 (remember- we got hit by the famous Fastnet Race storm in Newport!). It would be impossible to count how many times J/24s have circumnavigated Conanicut Island since, but it would be safe to say the “Around the Island Race” is the all-time favorite for generations of J/24 Fleet 50 sailors, not to mention a big income generator for local boat repair shops. If you have never raced along a rocky coastline interspersed with beautiful beaches, a cool summer sea breeze and lots of current, then this is the race for you! To commemorate the 40th Anniversary of the J/24 Class, J/Fest New England and Sail Newport invite all J/24 sailors, past and present, to enter the Around the Island Race with the first gun at 1300 hrs on Friday August 11th. To make a whole weekend of it, there’s W/L buoy racing Saturday and Sunday as part of J/Fest New England. For more J/Fest New England and Around Island Race sailing information Add to Flipboard Magazine. 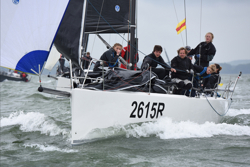 (Scheveningen, The Netherlands)- This coming week, the J/22 World Championship will be taking place as part of the world-famous North Sea Week, hosted in Scheveningen, The Netherlands. The 2017 edition will include a very competitive fleet of J/22 sailors from Canada, Cayman Islands, France, Germany, and The Netherlands. The fleet can count on professional race management and extensive social activities on shore as part of the North Sea Week experience, one of the world’s (and Europe’s) best summer-time mega-sailing events. What is the form for this fleet of thirty-nine boats? Ironically, the top billing must go to the top two visiting teams- one is a J/22 Worlds Vice—Champion- Mike Farrington’s 7-SITZER/ EX-ISLES from the Cayman Islands and the other is Canadian skipper Johan Koppernaes on RAISED J that has North Sails’ top specialist Mike Marshall as trim/ tactician. As for the continental European triangle of the German/ Dutch/ French teams, the leading crews on the leaderboard could be Fabien Toureaux’s BEASTIE BOYS, Reiner Brockerhoff’s JAZZY, Patrick Huet’s EUROPEAN HOMES, Svend Hartog’s MOJO4ROOKIES, Tom Losch’s JOUJOU3, Nienke Reina Jorna’s JAM SESSION, Jean-Michel Lautier’s FRAPORITA, Dirk Jan Verdoorn’s JUT EN JUL, Kim Bos’ DJINN, Lisanne Nijdam’s TU DELFT/BROACH/1365, Jochem GrootJen’s SLAM, and Nic Bol’s QUANTUM HOLLAND. For more J/22 Worlds sailing information Add to Flipboard Magazine. More Awesome J/125 Warrior Sailing Videos! (Santa Barbara, CA)- The J/125 WARRIOR has been having a lot of fun sailing off windy, sunny Santa Barbara on some spectacular sailing days this spring, enjoying the nuking conditions that often sweep around Point Conception to the north and blast the fleet with 20-35 kts winds on a clear day! On April 8th weekend was the famous Race to the Tower and back. Basically, a wind sprint on starboard gybe from the starting line set just off the famous pier at the southeastern part of the harbor- Stearns Wharf- then off to one of the big oil rigs offshore in the Santa Barbara Channel and return to the finish. In that race, the J/125 WARRIOR simply lit it up, sent it down to the rig at speeds up to 23 kts and won the fleet overall by three minutes. Here is the YouTube video of the experience by Paul Harteck, the son of the skipper Larry Harteck in the video. Then, as if they did not have enough fun on the April 8th Tower Race, then WARRIOR’s owner, Dr Laura Schlessinger, got in on the act for their May 4th extremely windy “Wet Wednesday Night” series race. Again, it was blowing up to 25 kts and the mighty WARRIOR took off again! With Dr Laura on the helm, they easily hit 21 kts of boat speed- “girl power on steroids! !” The crew included Sam Solhaug, Larry Harteck, Bill Daffron, Dean Duesette, Xander, Brett Decampos, Colin Campbell, and Steve Goularte. Watch the J/125 sailing video here. Add to Flipboard Magazine. (Halifax, Nova Scotia)- For the J/120 DEVIATION- practice, practice, practice- that is how it’s done to win the Marblehead to Halifax Race! Thanks for this story from Kathy Large/ Sailing photos by Tim Wilkes.com. His regular crew includes Mathew Christie as tactician, Jason and India White, Geoff Dalzell, Robert Maclean, Cameron Fraser and Dr. Sean Christie. Others who regularly take part, depending on the race are Giles Oland, Jonathan Ladha, and Stuart MacIntosh. Several J/teams with impressive records have already signed up; including at least three J/120s- Gardner Grant’s ALIBI, Jim Praley’s SHINNECOCK, and Stu McCrea’s J/120 DEVIATION (read their story on preparation below in J/Community section). Others are Chris Lewis’ J/44 KENAI from Houston, TX; Brad Willauer’s J/46 BREEZING UP from Scarborough, ME; and Phil Helmes’ J/133 FAST COMPANY III from Marblehead, MA. 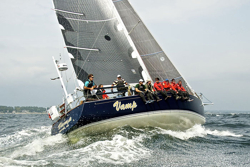 The event is a cooperative venture of the Royal Nova Scotia Yacht Squadron and the Boston Yacht Club of Marblehead. 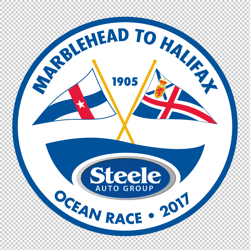 Title sponsor is the Steele Auto Group of Canada with USA supporting sponsors: Gill, Marblehead Bank, Harborside Sotheby’s International Realty and BNY Mellon Wealth Management. Among the current 73 entries, 34 are first timers, 17 are second timers and there are four entrants who have only missed two races since 1997. Richard Hinterhoeller of RNSYS, Co-Director, says one of those racing has entered every Marblehead to Halifax since 1997. The Marblehead to Halifax race will cap off a week of Fourth of July celebrations in the picturesque ocean side community. The Boston Yacht club will host a round of parties and receptions throughout the event. Sailing photo credits- Craig Davis For more Marblehead to Halifax Race sailing information Add to Flipboard Magazine. (Victoria, BC, Canada)- The “grand daddy of all offshore races” in the Pacific Northwest has to be Royal Victoria YC’s famous Swiftsure International Race. It is always a challenge no matter what the wind and weather conditions, particularly if fronts are rolling in off the northern Pacific and the Gulf of Alaska with lots of wind, wetness and breeding complete chaos in their wakes. This year, 176 boats are registered to race in one of the four main races that sail up and down the Strait of Juan de Fuca (so named in 1787 by the maritime fur trader Charles William Barkley, captain of the Imperial Eagle, for Juan de Fuca, the Greek navigator who sailed in a Spanish expedition in 1592 to seek the fabled Strait of Anián. Barkley was the first non-indigenous person to find the strait). Thirty-five J’s (about 20% of fleet) can’t wait to “beat the Strait” at its own infamous games, including a J/160, J/133, a J/46, a J/42, J/125s (2), J/122s (2), J/120s (4), J/109s (4), J/105s (8), J/30s (3), a J/33, J/92 and J/37. None of the J/crews are sailing the original race, the so-called Swiftsure Lightship Classic- a 138.2nm jaunt from the start off Victoria’s famous waterfront, out around a mark at Swiftsure Bank and return. Only two J’s are sailing the next longest option, the Hein Bank Race- 118.1nm to a mark at Neah Bay, a mark offshore on the other shore, and return. Those two are John McPhail’s gorgeous navy-blue J/160 JAM from Gig Harbor YC and Shawn Dougherty’s J/125 HAMACHI from Sloop Tavern YC. The most popular option for thirty-two J/Teams is the Cape Flattery Race- 101.9nm to a mark at Neah Bay and return to Victoria Harbour. In the PHRF H1 class are three teams, including Ron Mackenzie’s J/37 FUTURE PRIMITIVE, Tom Keffer’s J/42 VELOCITY, and Scott Campbell’s J/46 RIVA. The PHRF L1 class has four J/120s (Mike Picco’s WILD BLUE, Kirk Palmer’s LIGHT SCOUT, Jim Hinz’s HINZITE, & Chris Johnson’s WITH GRACE), two J/122s (Tom Kelly’s ANAM CARA & Bron Miller’s JOY RIDE), and the J/133 CONSTELLATION helmed by Bron Miller. The PHRF L2 class is a battle of the 35-footers, virtually all of them are top boats on Puget Sound and many have won events all over the Pacific Northwest. To say “the form” on this collection of J/35s and J/109 is difficult would be an understatement. In any event, the four J/109s include Jim Prentice’s DIVA, Adrian King-Harris’ J, Stu Burnell’s TANTIVY, and Tom Sitar’s SERENDIPITY. The three J/35s are George Leighton’s TAHLEQUAH, Jason Vannice’s ALTAIR and Karl Haflinger’s SHEARWATER. 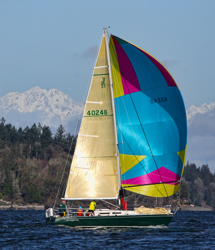 Not surprisingly, the J/105s have their own class, sailing as one-design for the Cape Flattery Race! Top boats include recent Oregon Offshore Race class and overall winner FREE BOWL OF SOUP raced by those “wild & crazy guys” from Portland, Oregon and led by their skipper Doug Schenk. They will be chased hard by top local crews, such as Jim Geros’ LAST TANGO, Chris Phoenix’s JADED and Chuck Stephens’ PANIC. 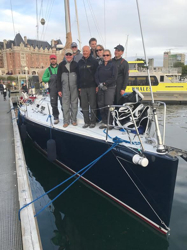 There is a quartet of J/teams sailing the shortest option, the Juan de Fuca Race- 78.7nm to a mark at Clallam Bay and return to Victoria Harbour. In that fleet are Phil Wampold’s J/92 ZAFF fighting three J/30s (Colin Bishop’s REDUX, Ulf George Gwildis’ IMPULSIVE, and Theo Singelis’ TAKU. Finally, getting out on the water and having fun with his J/105 for a daysail in the Inshore Flying Sales PHRF division will be Tom Kerr on CORVO 105! 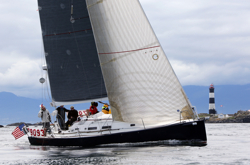 For more Swiftsure Race sailing information Add to Flipboard Magazine. 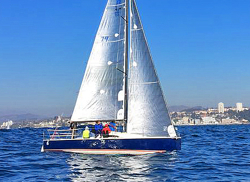 (Belvedere, CA)- Back in 2015, Encinal Yacht Club, San Francisco Yacht Club, Monterey Peninsula Yacht Club, Santa Barbara Yacht Club and San Diego Yacht Club joined forces and races to provide sailors with an exceptional Offshore Race Week that will take offshore boats from San Francisco down to San Diego with stops in Monterey and Santa Barbara. 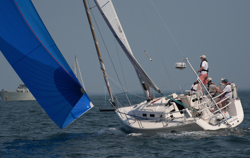 It brings the historic Spinnaker Cup and a revamped Coastal Cup together and joining in with the second running of the SoCal 300, racers have options of completing the entire week long event, or they can join in for any of the individual races on their own. The schedule is set up to keep the racing fast and fun and also allow enough shore time for family and friends to meet the racers at stops along the way for a wonderful week long tour of the California Coast. California Offshore Race Week starts on Saturday, May 27 in San Francisco Bay and sends the racers out under the iconic Golden Gate Bridge. From there the fleet will make their way 88nm to the port city of Monterey for a day long layover to get rested and ready for the sled ride to Santa Barbara. Picking up on Monday, May 29, the Coastal Cup starts in Monterey Bay and runs 200nm around Point Conception and into Santa Barbara. A multi-day layover in Santa Barbara will allow racers to experience the local scene and all that this beautiful city has to offer. Santa Barbara Yacht Club will be hosting shore side parties and all the racers are invited to a ‘just for fun’ in-port race on Wednesday afternoon, which will see the offshore crews link up with the local Beercan racers who will also be on the water that day. The final leg starts on Thursday, June 1 with the SoCal 300 sending the fleet through the Channel Islands on their way to San Diego, a total trip of 254nm. The awards ceremony will be held on Saturday, June 3 at San Diego Yacht Club. The Spinnaker Cup Race has thirty-nine entries, nine of which are J/teams (nearly 25% of the fleet!). The smallest boat in the race will be Chris Cartwright’s J/88 VENTUS, fresh off his experience of winning class and nearly the overall trophy in the 2016 Singlehanded Transpac Race! He will be joined by a number of offshore speedsters, including the classic J/36 DAWN’S EARLY LIGHT skippered by Kevin Mills, the J/105 JAVELIN helmed by Robert Goosey, the J/109 JUNKYARD DOG sailed by Jim Goldberg, two J/111s (Howard Turner’s SYMMETRY and Reuben Rocci’s SWIFT NESS), and three J/120s (Ludovic Milin’s SAETTA, Tracy Rogers’ HOKULANI, and Barry Lewis’ CHANCE). Sailing photo credits- ROLEX/ Daniel Forster. For more California Offshore Race Week and Spinnaker Cup sailing information Add to Flipboard Magazine. 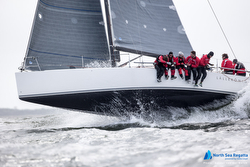 (Larchmont, NY)- A spring classic, this 186nm race from Stamford, CT down Long Island Sound, around Block Island, RI and back to Stamford is an annual rite of passage for many racing yachts. The Block Island Race was first held in 1946 and is a qualifier for the Northern Ocean Racing Trophy (IRC), the Double Handed Ocean Racing Trophy (IRC), the New England Lighthouse Series (PHRF), and the Gulf Stream Series (IRC). The Block Island Race is also a qualifier for the Caper, Sagola, and Windigo trophies awarded by the YRA of Long Island Sound and the 'Tuna' Trophy for the best combined IRC scores in the Edlu (40%) and the Block Island Race (60%). The race is often regarded by the offshore racing community in Long Island Sound as the start of the summer offshore sailing season. As a result, the race has many sailors who have participated for a few decades, starting as kids and now as adults (owners, crews, skippers)! For them, it truly is a rite of passage, breathing in all that salt air, getting soaked in salt water by giant chop breaking over the bow in the famous “Race” or “Plum Gut”— it’s all about becoming one with the sea again and feel that salt coursing through your veins and appreciating how small human life is relative to the extraordinary forces of nature. Answering that siren song to the sea is a very good fleet of offshore teams from across the Northeast. Sixty-five teams will be on the starting line off Larchmont YC in western Long Island Sound on Friday, March 26th, racing in PHRF, IRC, and Doublehanded divisions; thirteen of them are J/crews (20% of the fleet). The remnants of a Low is hovering over the northeast in the Marblehead, MA area, spinning cool temperatures, drizzle, and solid breeze from the WNW at 15-25 kts. It’s a promising start and the first leg out to Block Island should go fast, in particular for the asymmetric J’s in the fleet. In the IRC Doublehanded class, Gardner Grant’s famously successful J/120 ALIBI with by vying for class honors. Doug McKeige’s J/88 JAZZ will be doing the same with a Young American Junior Big Boat Team going for it in the PHRF Doublehanded class! The eight boat PHRF 3 class has a quartet of J/105s battling with a trio of First 36.7s for class honors. The J/105 crews re Francis Racioppi’s HOONIGAN, Hobie Ponting’s PRIVATEER-YCC, Frank Conway’s RAPTOR and the famous Young American Junior Big Boat Team sailing their YOUNG AMERICAN-YCC! As always, the question on everyone’s mind is “can the kids do it again!” We wish them fair winds and fast sailing! In the PHRF 4 class, Jim Farrell’s J/35 SAPPHIRE from Black Rock YC will hope to beat out a Tripp 40, a Thomas 35 and a Sou’wester 51! The nine-boat IRC 2 class has a wide range of fast offshore racer-cruisers, including past winner Len Sitar on his mighty J/44 VAMP, Carl Olsson’s champion J/109 MORNING GLORY, and yet another Young American Junior Big Boat Team on the J/120 VAREKAI-VCC! 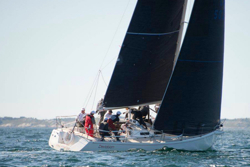 PHRF 5 class has three J/crews that will particularly like the course layout for the forecasted winds; the two J/111s are John Donovan’s LIBERTAS and Abhijeet Lele’s VARUNA and the J/122 SUMMER GRACE is skippered by Kevin Kelley. Finally, watch out in PHRF 6 class, one of the offshore flyers from the J/Design team will be fighting tooth & nail with other fast 40 footers, like Class 40s, custom 40, Farr 40 modified and an IMX 45. Taking them on and sure to give them all fits will be Brian Prinz’s J/125 SPECTRE from Branford YC. 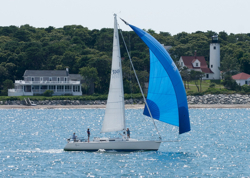 For more STC Block Island Race sailing information Add to Flipboard Magazine. (Houston, Texas)- It has been a busy month for the J/24 class on a worldwide basis. After hosting the USA Nationals in Seattle, WA the past week, this week there are two events taking place simultaneously; one is the J/24 North American’s in Houston, TX and the other is the Open J/24 Italian Nationals in La Maddalena, Sardinia! The winner of the USA J/24 Nationals, Keith Whittemore, is sailing in Italy while the 2nd place finisher, Will Welles, is sailing in Houston! Spoiled for choice, those J/24 sailors are! From May 25th to 28th, thirty-four J/24 teams are headed down to sail on the choppy waters of Galveston Bay, hosted by the amazing volunteers at the Houston YC. No question, the J/24 sailors will be spoiled with good’ole fashioned BBQ’s, beer, brats, and lots of involuntary swimming in their giant pool. On the water, the racing will be tough, with a number of excellent teams that will be fighting for NA title honors. Chief amongst them will be Will Welles BOGUS, others will be Natalie Harden’s GIGGLES (perhaps the top woman skipper in the class), Chris Holmes’ BAD MOON, Carter White’s SEA BAGS SAILING TEAM, Mike Ingham’s NATALYTICS, Aidan Glackin’s MENTAL FLOSS, the Japanese crew of Nobuyuki Imai on SIESTA, Travis Odenbach’s HONEY BADGER, and Robby Brown’s ANGEL OF HARLEM. For more J/24 North American Championship sailing information Add to Flipboard Magazine. (Annapolis, MD)- The Fort 2 Fort Races are comprised of three separate record challenges in Annapolis and Baltimore, linking historical forts of Fort Severn (United States Naval Academy) and Fort McHenry across Chesapeake Bay. The three races are the Fort 2 Fort Race, the R2 Challenge, and the Star Spangled Banner Challenge. Each race is designed to be sailed in either direction to promote the best sailing conditions based on the weather window to set a new record. The races can be entered between April 1st and November 1st each year. With each paid entry, your entry gives you the ability to enter all three challenges, a combination of the three, or the same challenge three times. Each entry must be submitted with a valid .gpx file to verify course times. 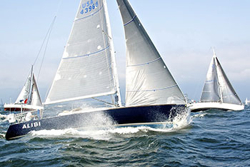 Eligible classes are Monohull A (15 Ft and below), Monohull B (16 Ft – 30 Ft), Monohull C (30+ FT), Multihull A (20 Ft and below), and Multihull B (21 Ft+). In addition to these classes, there will be an overall record, and PHRF record. If there are 5 or more One Design boats entered, than a One Design Class will also be scored. The Fort 2 Fort Race is between Annapolis (Fort Severn/ Naval Academy) and Baltimore (Fort McHenry). The course is approximately 38 miles starting or finishing depending on the direction of choice from Triton Light at the Naval Academy, to Government Marks off Fort McHenry. The R2 Challenge is between Triton Light at the Naval Academy and Severn River Marker R2. The course is approximately 3.8 miles and can be run from either direction. The Star Spangled Banner Challenge is between Government Marks off Fort McHenry, and the Francis Scott Key Buoy near the Patapsco Bridge. Since the buoy is only in the water starting on June first each year, the Government Marks adjacent create a line through the buoy. The course is approximately 3.4 miles and can be run in either direction. A portion of the entry fees will be donated to area organizations and foundations supporting sailing and the Chesapeake Bay. If you have any questions please email- racedirector@fort2fortrace.com or contact race founder- Drew Beach- drewjbeach@gmail.com. For further information on the Fort 2 Fort Races, please visit here. Add to Flipboard Magazine. (La Maddalena, Sardinia, Italy)- The 37th Italian National Open J/ 24 Championship will be featured on May 23rd to 28th in the enchanting seaside town of La Maddalena. The countdown to the most anticipated event of the Italian J/24 sailing season sees thirty-five crews already registered to sail in the gorgeous azure blue waters of the Mediterranean off the southeastern coastline of Sardinia. The bay of Cagliari is famous for its steady, predictable sea breezes that can build out of the southeast from 10 to 18 kts on any sunny day; only the meltemi (sirocco) can overpower it if it blows out of the north from the Italian Alps at 35 to 50 kts! There are twelve races scheduled and there will be no more than three per day. The Championship will be valid with a minimum of four races completed and with five races, the scores will reflect a discard race. More determined than ever to defend the tricolor title will be last year’s champions- ITA 503 owned by Marco Stefanoni (LNI Mandello) and skippered by Francesco Bertone (CVLa Scuffia). On a roll this spring and certainly their strongest challengers will be ITA 416 LA SUPERBA, skippered by Italian Navy sailor- Ignatius Bonanno. 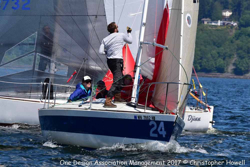 A past winner of the “open” division will be attending, the top American J/24 sailor, Keith Whittemore from Seattle, WA, skippering USA 5399 FURIO. Other top Italian crews that will be a factor on the leaderboard should be ITA 212 JAMAICA skippered by Pietro Diamanti, the young team on ITA 304 FIVE FOR FIGHTING led by Eugenia de Giacomo, the Sardinia leaders on ITA 405 VIGNE SURRAU skippered by Aurelio Bini and ITA 443 ARIA skippered by Marco Frulio. "A good thanks to those who are working for the success of this Championship and to make Maddalena stay pleasant and engaging; I especially want to thank Discover Nikola Tesla Elica, Cantine Contini, Moby Line, Delcomar and Tirrenia for their valuable support. At the event, the J/24 Class has entered into an important agreement with Moby Line- Tirrenia for the carriage of boats from the ports of Genoa, Livorno and Civitavecchia to Olbia. Delcomar offered free return to Palau-Maddalena for all competitors. 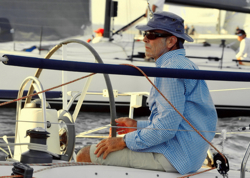 Significant agreements have also been reached with the accommodation facilities,” explained the organizer and former president of the Italian Class J/24- Mariolino Di Fraia- he is sailing his ITA 460 BOTTA DRITTA MAYOR in the regatta. “Furthermore, I am sure, the active collaboration with the Italian Navy for regatta support and management will make for an even more impressive stay in Maddalena! 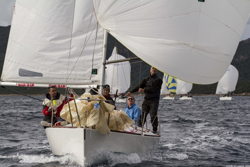 !” For more Italian J/24 Nationals sailing information. Add to Flipboard Magazine. (Seattle, WA)- Last weekend, Seattle YC continued their popular Tri-Island Series of races, hosting the Vashon Island Race on Puget Sound for a fleet of nearly eighty boats. The J/teams all faired well on the circuitous course down and around the island chains in the Sound, with some crews advancing their cause and continuing to elevate in the series standings. In the PHRF 2 Class, Shawn Dogherty & Jason Andrew’s J/125 HAMACHI did not race, but they still sit third in class for the series. In the PHRF 3 class, Ron Holbrook’s J/133 CONSTELLATION took a 4th in class. 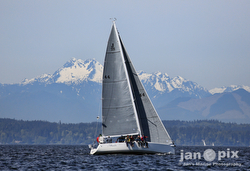 The PHRF 4 class was led by Jim Hinz’s J/120 HINZITE, taking 2nd in the Vashon and sitting in 2nd for the series. Third was Jerry Woodfield’s J/109 SHASA (now in 4th for the series) and fourth was Mark Liffring’s J/120 WITH GRACE (now sitting in 3rd for the series). The large J/105 class is experiencing a bit of a “schooling” on how to sail the tricky “island” series. Erik Kristen’s MORE JUBILEE is on a winning streak, posting another first to easily be leading the series. Lance Rummel & David Cohen’s INCONCEIVABLE added a 2nd to their scoreline to now sit in 2nd for the series. Third in Vashon was Chris Phoenix’s JADED (4th in series) and then taking a 4th place and sitting in 3rd for the series is Jim Geros’ LAST TANGO. In the PHRF 8 class, Leo Morales’ J/27 WIZARD is sailing well and consistently, posting a 3-6 tally in the Protection Island and Vashon Island races to be just 2 pts out of second for the overall. 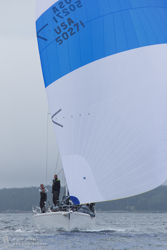 Finally, in the PHRF 9 class, Bill Boyeson’s classic J/42 JIMINY won the Vashon to be leading the series by a point. Sailing photo credits- Jan Anderson/ Janpix.com. For more SYC Tri-Island Series sailing information Add to Flipboard Magazine. (Camaret-sur-Mer, France)- The 16th Grand Prix Ecole del Navale is taking place this weekend in Camaret-sur-Mer with 218 participants. 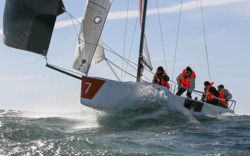 The three-day event goes from May 25th to 28th and is raced both in the bay and offshore in the Bay of Biscay. 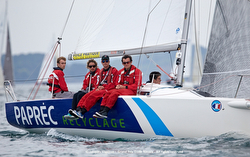 Included in the event is the J/80 class, sailing their second event in the summer-long France J/80 Cup series. 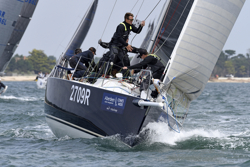 Most of the top J/80 teams from across France are participating in the forty-eight boat class, including Simon Moriceau’s ARMEN HABITAT, Eric Brezellec’s COURRIER JUNIOR, Ludovic Gilet’s NUMERO J, top woman skipper Capucine Vitel on her VITEL SAILING TEAM, Luc Nadal on the familiar GAN’JA, and another top woman skipper- Maxime Rousseaux on J’RAFON. The J/80s should have a nice weekend of sailing as the forecasts from the UK MET office and the French MET office indicate good breezes all three days! 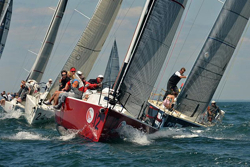 For more J/80 GPEN sailing information Add to Flipboard Magazine. J/105 "The Soup" Wins PHRF Overall! (Victoria, BC, Canada)- The prestigious trophy for winning first Overall in the Oregon Offshore International Yacht Race will have another THREE names emblazoned on it this year - Schenk, Hopper & Davis. The trio sailed their J/105 FREE BOWL OF SOUP to an overall victory in the 2017 race under blustery conditions. “Congratulations” to the crew! They were not only the PHRF Overall winner, but the J/105 Class winner, too. In fact, J/Teams in general sailed extremely well; with six J’s in the top eight boats overall. The Oregon Offshore is one of the toughest races on the entire West Coast and also one that has seen very loyal teams participate year after year; the event is hosted by Corinthian YC of Portland and the Astoria YC in Astoria, OR along the opening of the Columbia River. Historically, the race acts as a “feeder” for the Swiftsure Race and for the Vic-Maui Race, too. The race starts off the Columbia River Buoy 2 and goes 193nm north to the Strait of Juan de Fuca, leaving Duntze Rock buoy to starboard and finish off the piers at Victoria, British Columbia in Canada on the northern side of the Straits. Twenty-one teams entered this year and besides the J/105s, other J/Crews gathered their fair share of silverware. 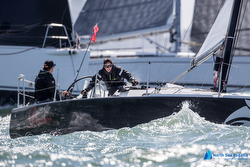 The PHRF A2 Class saw a sweep of the top three positions on the podium, led by Corinthian YC’s Scott Campbell and his team on the pretty blue J/46 RIVA (4th overall). Second in class was Tom Keffer’s J/42 VELOCITY (5th overall) and third in class was Tom Kelly’s beautiful blue J/122 ANAM CARA (6th overall). Behind the winners in the J/105 class (the “Soupers” that also won last year’s PHRF A class), it was Doug Pihlaja’s ABSTRACT that took second place (3rd overall) while Dana Sibilla’s ESCAPE ARTIST placed third (8th overall). That is a great showing for the J/105s in general. For the two “newbies” in the race, it was especially gratifying to do so well overall, too!! For more Oregon Offshore Race sailing informationAdd to Flipboard Magazine. 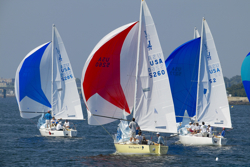 (Edgartown, MA)— Edgartown YC Race Weekend isn’t your typical regatta. For starters, it has two parts: one for the much revered and time-tested (79 years old) distance race around Martha’s Vineyard and another for two days of short-course racing (added in 2012) in Edgartown’s Outer Harbor. And no need to fret if you can’t do it all. Only the ’Round-the-Island Race (‘RTI) on Saturday, July 22 requires an entry fee, and to boot, each day of the ’Round-the-Buoy Races (‘RTB) are scored separately, so if you can make one day and not the other, you can still win silverware in your class! Though he considers himself to be “basically a local racer,” Besse broke the pattern last year and competed in the Newport to Bermuda Race. He and his Après team wound up winning the J/120 class. Regularly attracting entrants from the Eastern Seaboard and beyond, Edgartown Yacht Club Race Weekend delivers exceptional racing opportunities for boats 28 feet and longer in classes for IRC, ORC, ORR, PHRF (spinnaker and non-spinnaker divisions), Double-Handed, and Classic. A Welcome Reception on Wednesday night (July 19); a Mount Gay-sponsored “jump-up” party on Friday night; and prize givings on both Friday and Sunday (July 23) round out the schedule for competitors who are entered in one or the other, or both, of the racing sessions. Deadline for entry is Wednesday, July 19 for the ’Round-the-Buoy Races and Friday, July 21 for the ’Round-the- Island Race. For more information, go to http://www.RTIrace.org or contact raceadministrator@edgartownyc.org. Add to Flipboard Magazine. NEW J/121 Offshore Speedster Update! Youth J/70 Sailors Sailing Fast Offshore! 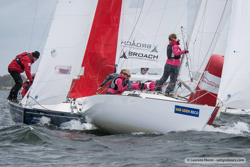 USA J/24 Class Enabling Young Sailors! 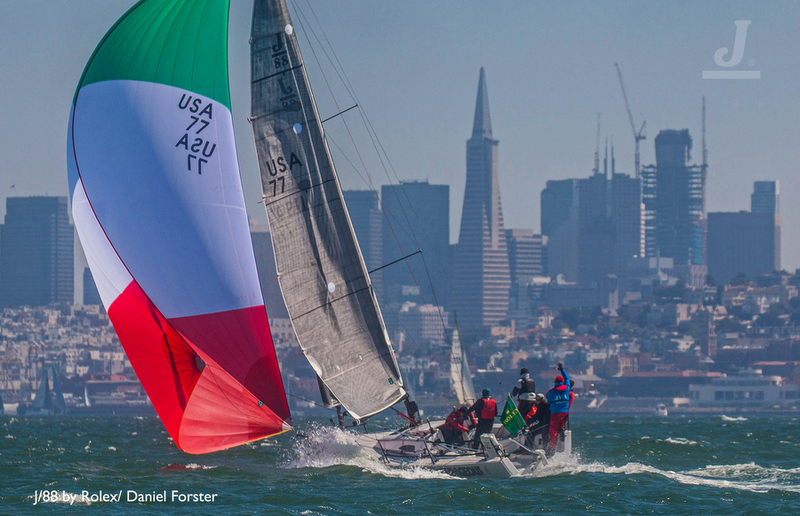 California Offshore Race Week Returns! Glorious AYC Spring Series Finale! 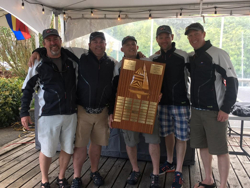 J/105 SANITY Wins Yachting Cup Overall! Stormy, Windy Annapolis NOOD Regatta! Annapolis Growing Sailing Sport With Kids! Blakely Rock Benefit Race Success!! Glass Out @ Warsash Spring Series Finale!